Survivable World: winner of the 2003 Washington Prize and finalist for the Thom Gunn Award in Poetry. I am happy to autograph a copy for you. All copies sold through this link will help fund Seven Kitchens Press. but does not stop to say hello. and drooping black felt hat, though he’s passed this spot four times. a pair of muscled legs. It is not the man attached. none will deliver me. The Greek man bites his nails. why no one has found him. More poems from Survivable World:“San Francisco Zoo” and “Inventory” from Diagram 2.1; “Suddenly” from Verse Daily. The David Museum: winner of the 2002 Diagram/ New Michigan Press Chapbook Award. Cover art by Roz Richards. Still available from New Michigan Press, or email me to get a signed copy for only $10 (these sales will go toward the support of Seven Kitchens Press). and staid compared to my tangential mess. I must have sensed you were my counterpart. I held my breath and leapt, and tried to meld. your pride, your partner realized, content. I knew you knew my every word by heart. these days when by comparison our friends are gone. my awkward love, lost boy, you’ve been absolved of all. I know that I deserve this emptiness. 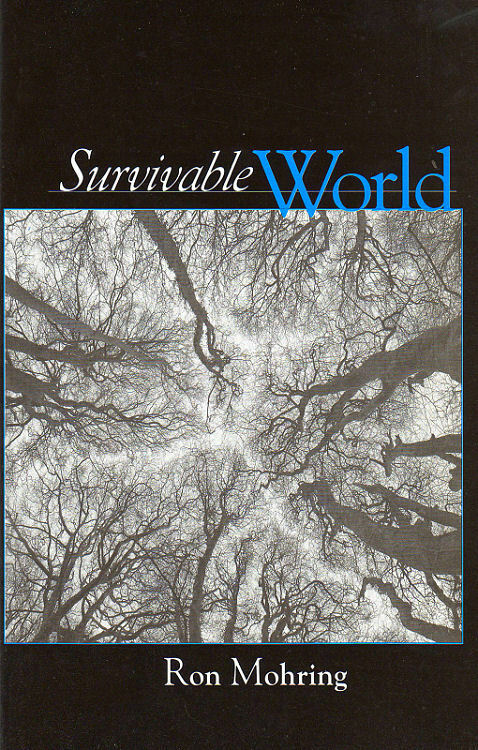 I recently received Survivable World, with your lovely message and signature (for which I thank you). I just want to let you know how electrifying these poems are to me. Their bare honesty, the subtleties of love and loss expressed and exposed. That they (you) are so fearless about digging deep into the pit of fearfulness, the dark side of love, the loneliness of grieving, and the refusal of silence. These are beautiful poems, and they ring true. I am so sorry for your loss, but grateful for the craft with which you honor it. I spent eleven years working at Gay Men’s Health Crisis, surrounded by dying friends, colleagues, and the incredible volunteers I was privileged to supervise. The losses too numerous to mention, but each of them always remembered. Your poems, your own personal life journey, and how the epidemic scathed you: I’m sorry it took me so long to find your poems, and very grateful to have them now. You are a great poet. Powerful, honest voice, Ron. Your banal elegy hurtfully, helpfully true. I’ll go find one of your books at Powell’s tomorrow.